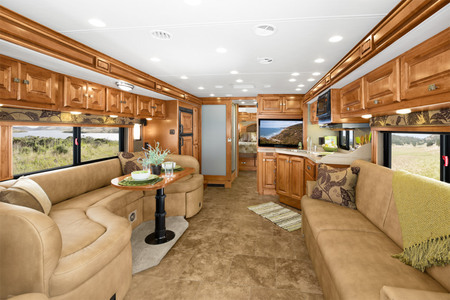 The Allegro RV is built by Tiffin Motorhomes in Red Bay, Alabama. With manufacturing 40 years of experience, you know they build a well known motorcoach. Starting at 28 feet long and going all the way up to 45 feet long, the range is one that will surely find a home for you. Each one is special in it's own family. ZEPHYR as the top models available. Each one has options that are suitable for any need you may have. With so many paint schemes, your choice is the best choice because they are all grand. The interior colors coordinate with the paint and are just adorable. Taking one on the road will bring you easy traveling. The cockpit is full of extras you will want in your view. Ease of use is important to you and to the manufacturer. Finding room to store all your belongings will be easy due to the large storage areas and there are lots of them. It is not a problem to bring along everything you will need. With a Powerglide chassis and comfort leveling, the ride is like riding on a cloud. Finding room to sleep is not an issue, either. You have 2 sleeper sofas and a king sized bed in some models. Having 1 and 1/2 baths is also a plus. If you need extra sleeping room, get the one with the optional bunk beds. This is great for traveling with kids. Problem solved. An Allegro is one beautiful motorhome inside and outside. The hardest part is choosing the one that you like best, if that is possible. You may have to draw straws just to make a decision! Look at this Allegro RV interior! What more do you need in an RV? Looks like you have everything possible to put into a motorhome. Interior colors and designs vary from model to model, but they are all just this elegant. Looking for a motorhome with luxury? Be sure to check out this one before you decide. If you are in the Red Bay, Alabama area, go by and check them out.